^ ...], [contributors Rachel Barnes (2001). The 20th-Century art book (Reprinted. ed.). London: Phaidon Press. ISBN 0714835420. ^ Coen, Ester (1989). Umberto Boccioni. New York: The Metropolitan Museum of Art. p. 272. ISBN 0870995227. ^ "Giacomo Balla (1871-1958)". Encyclopedia of Visual Artists. Retrieved 19 July 2016. ^ "Giacomo Balla". Encyclopædia Britannica. Retrieved 20 July 2016. ^ Lubbock, Tom (September 3, 2009). 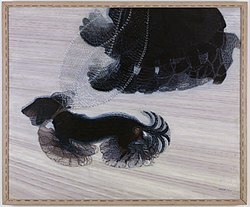 "Great Works: Dynamism of A Dog on a Leash (1912) Giacomo Balla". The Independent. Retrieved 20 July 2016. ^ Marta Braun: Giacomo Balla, Anton Giulio Bragaglia, and Etienne-Jules Marey. In: Vivien Greene (ed. ): Italian Futurism 1909 - 1944. Reconstructing the Universe, Guggenheim Museum 2014, p.95-101 Braun states (p.96): "For Balla, perhaps the most photo-literate of the Futurist painters, both Marey's scientific analyses and Bragaglia's blurred trajectories presented an opportunity to move beyond his earlier, more realistic works." ^ Bertrand, Sandra (July 24, 2014). "Invasion of the Italian Futurists". Highbrow Magazine. Retrieved 1 November 2016. ^ Greenwald, Xico (April 22, 2014). "Back to the Futurism". New York Sun. Retrieved 1 November 2016. ^ Poggi, Christine (2009). "Photogenic Abstraction: Giacomo Balla's Iridescent Interpenetrations". Inventing Futurism: The Art and Politics of Artificial Optimism. Princeton University Press. pp. 109–149. ISBN 9780691133706. ^ "Giacomo Balla: Abstract Speed + Sound (Velocità astratta + rumore)". Peggy Guggenheim Collection. Retrieved 20 July 2016. Wikimedia Commons has media related to Giacomo Balla.